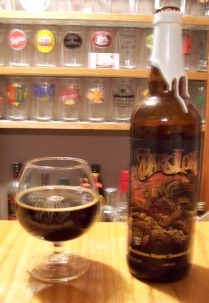 Mysteriously dark - like a black hole in space - with minimal head, Dark Lord 2009 was impressive. This is the biggest Imperial Stout that I have ever enjoyed. It's on par for density and richness with Bourbon County Stout. I can only imagine what the barrel aged version, Pappy Van Winkle must be like. The malty aroma meets a 'cocoa sweetness like brownies in the oven' according to Jay. I noted a carrot like flavor like Brooklyn's Black Chocolate stout with notes of ketchup. Overall this brew is excellent, extremely sweet and full bodied, it lacks the complexity of Founders CBS. I would rate CBS above Dark Lord because of its balanced complexity. But this a somewhat unfair comparison because CBS is barrel aged and therefore no longer belongs to the Imperial Stout category - in fact I am not sure that it is considered an Imperial Stout to begin with. Dark Lord is what I expected Brooklyn Black Ops to be. But Black Ops while decent, is highly disappointing if you are in search of big beers. Dark Lord definitely lives us to its reputation. This page contains a single entry by Brewmaster published on February 9, 2012 11:21 PM. The CZAR Imperial Stout - Avery Brewing Co. was the previous entry in this blog. Brewing New York's History at the New-York Historical Society is the next entry in this blog.